Chains of Destiny is the new luxurious High-End, and limited edition, energy infused jewelry set, consisting of a Necklace and a Bracelet, designed by DeMar; specifically, created for the individual that wants to utilize his energies in a plethora of ways. 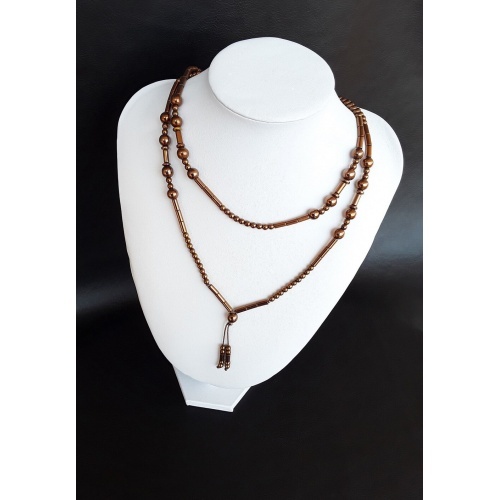 By combining pure high quality Bronze/Copper Hematite gemstones an elegant jewelry set has been formed to radiate the beauty of its wearer and to support his or hers cause. Moreover, each material, and gemstone, that has been utilized in the creation of Chains of Destiny has gone full circle through energy infusion. 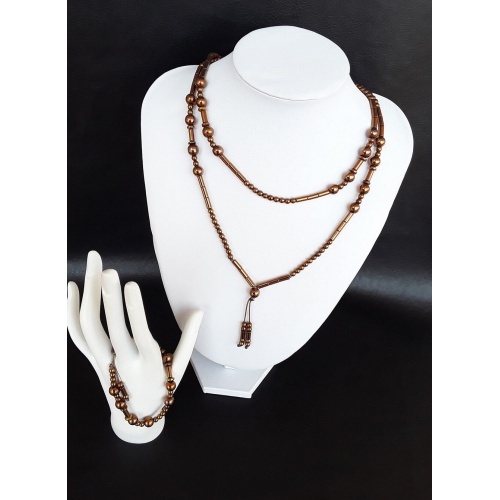 If you are looking for a unique, an elegant, a luxurious and a radiating and powerful jewelry set that embraces the power of Luck, Fortune and Destiny, Chains of Destiny is the jewelry set for you. 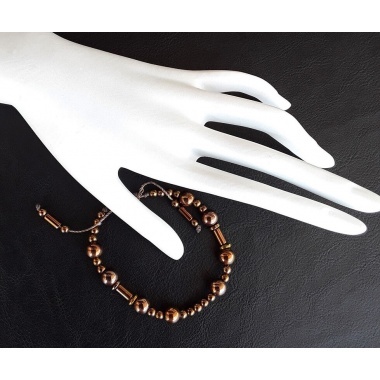 Copper is known as the lucky metal, as well as the healing metal. It is the conductor of the spiritualist’s belief system. It conducts spiritual energy back and forth between individuals, crystals, auras, the mind and the spirit world. Copper is linked with the Divine and attributes to the Queen of Heaven. Any stone with Copper, in or around it, is said to have enhanced properties. Copper even enhances the energy of Silver and Gold. Copper is a plentiful metal ore that ranges in color, from a gentle red-brown to a dark brick red. It has high electrical and thermal conductivity and also very malleable. Why Would You Use Copper? Copper is known to stimulate energy flow and enhance your psychic abilities. It’s an energy conductor that will move energies and amplify your thoughts. When used together with Petrified Wood, it will amplify your thoughts and send healing energies all over the body. It will also encourage you to achieve physical and emotional alignment. This will result in clearer thinking and less aggressive behavior. You will also enjoy a boost in your self-esteem. When someone is feeling agitated, angry, or distraught, your calming energies will help them calm down as well. Copper is a warming stone. It will help you release excess charges of anger or resentment. The mineral makeup of this stone will also balance the energies of the warm sun and the cool moon. It’s an excellent stone that will increase your ability to express yourself and accept your true emotions. Copper will make sure that your personal energy reserve is full so that you can be up for anything even at such short notice. How Will Copper Help You? Copper has been used for healing and medicinal purposes for thousands of years. Ancient cultures made use of Copper as a healing mineral with healing properties beneficial to the internal and external bodies. Copper is the third most abundant trace mineral that can be found in the human body. It’s transported throughout the body with the help of proteins in the bloodstream. The liver and the human brain also contain the largest amount of copper. People need approximately 3 milligrams of copper each day in their diets. It can be used in the treatment of skin diseases and wounds. It can also be helpful with internal diseases, such as heart disease, cancer, anemia, and rheumatoid arthritis. Copper can be used to improve blood circulation, to increase overall physical energy, and to detoxify the body. It can also be used to ease joint stiffness and the discomforts of arthritis by opening the flow of blocked energies. It can increase physical energy and mental agility. It can also support the body’s natural healing process. It’s an essential component of melanin, which gives color to the eyes, hair, and skin. Copper is responsible for keeping the hair from turning grey or thinning out. It’s also needed to support lysyl oxidase enzyme which is used in synthesizing and maintaining bones and connective tissues. Copper also provides support to collagen and elastin productions. Copper can be very effective when used for issues associated with the stomach and intestines. When placed next to the skin, it soothes the pains of rheumatism, arthritis, and other inflammation problems. When there’s good blood circulation, there’s also a better blood flow, which can lessen any pain that the body is feeling. Copper is beneficial to the lungs because it can improve the oxygen exchange and filter out the pollutants. Mucous membranes and soft tissues retain more moisture and grow less susceptible to irritation. 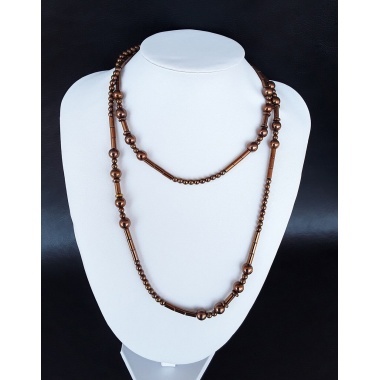 Copper is known to be the giver of goodness and positivity and the bringer of good luck. It can also bring positive energies when acquiring properties and possessions. It can attract money, prosperity, and abundance. It can draw wealth to your home or your business when you place it in strategic spots. It will encourage you to take more initiative in your financial pursuits. It will make you more optimistic about your prospects and give you a sense of independence when it comes to making your own decisions. It will sharpen your intuition so that you will know how you should proceed when facing a financial crossroad. Copper is known as the “love metal” because it will help you open up to love energies and address any sexual imbalance. Whatever is ailing your relationship or your love life, Copper will help zero in on it and find the best solutions. Copper will help you combat laziness, passiveness, and lethargy in your relationship. It will remove all dissatisfaction that you may be feeling, and it will help you accept yourself for who you truly are. It will stimulate optimism, initiative, diplomacy, and independence in your relationship, just like Amazonite. It will teach you to be kinder and more responsible towards the person you love. Copper will also give you the understanding to release your restrictions that you have set within yourself when seeking love or creating the life that you want for yourself. It will make you more aware of the quality of your thoughts and emotions, and how you’re expressing them to the world. Copper energies will facilitate a better communication and connection with the person you love and invite more love, understanding, kindness, and forgiveness in your relationship. Copper will bring in more love into your life. If you’re single, you will find more worthwhile romantic pursuits that have the potential to be the real thing. If you’re in a relationship, you will also be able to breathe new life into a suffering relationship. You will be able to rekindle the passion and mend what’s broken. There will be more gentleness and tenderness, and there will be more fun and enjoyment between you and the person you love. Copper is used to promote good health and create calm and balance in your life and in your home. Use this stone to disperse negative energies in any room and to attract positive change in that space. Negative energies are absorbed by Copper. It can become dull over time when you use it all the time to treat negative energies. This is why you need to charge and cleanse your Copper on a regular basis to keep it powerful and vibrant. Copper is often used to stimulate the flow of energies from the universe to your spiritual being. By meditating with Copper, you will be able to develop your psychic abilities and allow for an easy transfer of energies within yourself that will align your thoughts with your actions. This is a useful metal when it comes to meditating for the purpose of channeling your spirituality and contacting a higher dimension. With the energies of Copper, you will be able to connect with your guardian angels and call on them when you need their support and guidance. When used in pairing with Petrified Wood, Copper can boost your mental capacity and amplify positive thoughts that will heal your body and soul. In addition to bringing about an alignment of your physical and emotional energies, Copper will also clear up your mind and ensure that you stay calm and composed during chaotic times. It calls on you to maintain composure rather than exhibiting aggression because when you cater to negative thoughts, you are only inflicting harm upon yourself. Even in the hardest of times, Copper will give you the strength and stamina to stay hopeful of a better future. It brings with it a much-needed boost of self-confidence and calls on you to allow your self-esteem to grow because that will play a huge role in developing your personality. The energies of Copper will also make you realise that your blessings can help someone else out as well. When you exude soothing energies in your aura, you will be able to console someone who is angry and frustrated with life. Your peaceful demeanor will serve as an inspiration to them to be more optimistic in the face of hardships and this thought will warm up their soul as well as yours. Copper holds the balancing forces of the warmth of the sun and the calmness of the cool moon, which translates into a similar kind of balance within you when you meditate with it. The stone has an excellent ability to give you the confidence to express yourself more openly and effectively and admit to your true inner self. When you meditate with Copper, you will also feel energized to a great extent. All the energy that you receive from Copper will ensure that you are never too worn down to focus on yourself even after a hard day at work. It replenishes your reserves of personal energy and enables you to be bold in the face of a threat so that you can overcome it in the best possible way. The healing properties of Copper not just have emotional and physical implications, but they also mend your soul. When you feel positive on the inside, you will attract the positive forces of the universe. The energies of Copper will attract good things towards you. It is also believed to bring good luck and prosperity so that you can stay motivated to pursue your true desires and do what makes your soul feel alive. There are many reasons why you should use Copper. It’s known as the lucky metal and the healing metal because of its many wonderful benefits. It acts as the conductor of your spiritual belief system. It will transport spiritual energies back and forth between you and the people in your life, between auras, between your stones and crystals, and between your mind and the spirit world. It will stimulate a powerful flow of energy and activate your inner vision. It will also infuse you with psychic energies that will aid your channeling work. Copper is very useful to have when you need to regain your balance, improve your communication, and kindle synchronicity. It will balance your chakras and meridians. When you connect Copper to other stones and crystals, it will create a smoother transmission of energies to you!